Source: CICH using data adapted from Statistics Canada, Catalogue no. 91-209-X. http://www.statcan.gc.ca/pub/11-402-x/2012000/chap/c-e/c-g/desc/desc03-eng.htm -accessed March 19, 2017. 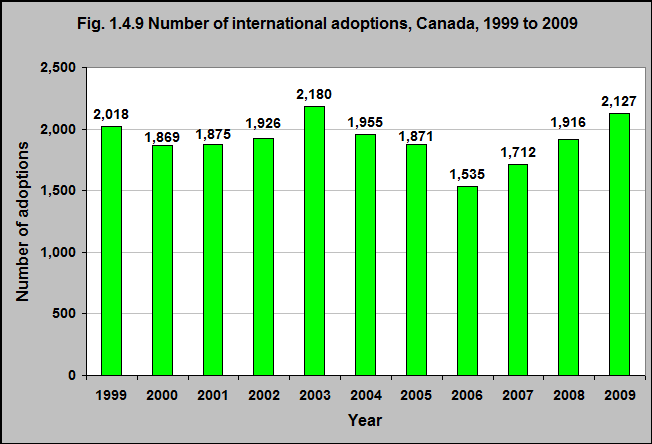 Between 1999 and 2009, there were a total of 20,984 international adoptions in Canada. The number of international adoptions peaked in 2003 at 2,180, then declined to 1,535 in 2006 and then rose again.